After 15 years of crawling across the surface of Mars, NASA’s Jet Propulsion Laboratory (JPL) team sent the last-ever commands to its Opportunity rover today. The rover landed on Mars in 2004 for what started as a 90-day mission. It has since become the longest-running rover NASA has ever sent to Mars. A vicious dust storm forced Opportunity into radio silence back in June — the fiercest Martian storm NASA had ever observed. Dust covering the rover’s solar panels caused it to drain its battery reserves. 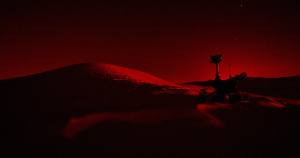 Now, a bitterly cold Martian winter means that Opportunity had virtually no chance of waking itself up. Opportunity allowed us to uncover a number of Mars’ secrets. In 2004, the rover’s high-resolution images revealed the presence of hematite — a mineral that typically forms in water. In 2012, it found a patch of nearly pure silica that might have originated from a hot-spring-like environment. Clay minerals and veins of gypsum gave scientists even more evidence for the historical presence of water on Mars. NASA will hold a press conference this afternoon to reveal the fate of its much-beloved rover.